* Imagine if Nutella had a caramel flavor. Now dip some licorice in there. That’s the top of Aomassai. * It feels really dense and syrupy, making it feel like a winter comfort scent. * The nutella smell says dominant as some spices come into play. * Only after about three hours does the projection start to calm down. Before this, it broadcasts quite loudly. * The sweetness continues into the base when light incense floats over sweet woods. 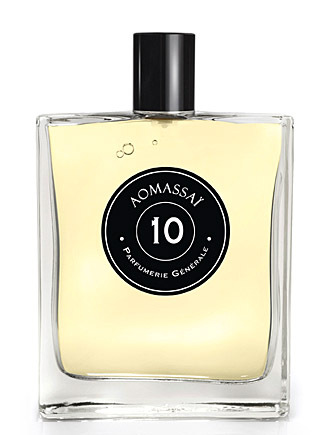 Summary: Aomassai is a decadent gourmand fragrance. If you crave something sweet without the calories, this is a nice way to go. The density and projection make this a fall/winter scent and not appropriate for hot climates and especially not an office setting. Although it’s labeled as an Eau de Toilette, it wears heavy and strong like a powerful Eau de Parfum (bordering on extrait). The dark, sweet nature of the scent reminds me of Angel/A*men, but a little more refined, so if you like either of those scents, this is definitely worth a try. Please be sure to test this one as every other review I’ve found has a completely different take on it. Parfumerie Generale Aomassai is available at LuckyScent and Osswald.